Just a quick image this week while I try to chew everything I've bitten off. 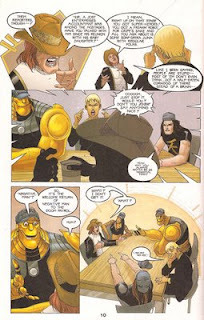 This is from the second issue of John Byrne's 2004 reboot of the Doom Patrol. To say Larry's got a skin condition might be a little bit of an understatement. More later this week as things get tamed. 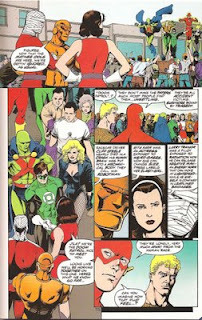 For this week's Elasti-Girl Friday, I decided to highlight part one of the the Doom Patrol's appearance in the phenomenal Mark Waid-written, Barry Kitson-drawn JLA: Year One series. 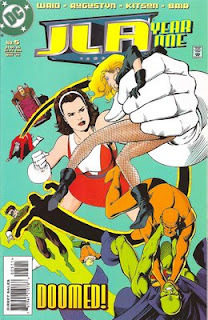 Rita appears on the cover, treating Black Canary like a Barbie doll. This issue is chockful of wonderful Silver Age goodness, as is the entire series. I urge you to track it down, either in floppies or TPB. I love how Barry Kitson matched up Green Lantern and Negative Man in the first (and feel free to correct me if that's wrong) team-up between the JLA and the DP. Cliff taking on Martian Manhunter is inspired too. I'm curious what happened to Aquaman in this struggle as he appears to be down for the count. Flash is also nowhere to be seen. The story is a very Silver Age-ish affair. The Brotherhood of Evil is stealing parts from people and creating a Frankenstein's monster-like army. 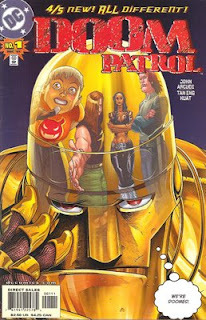 The Doom Patrol hits the scene first and are quickly upstaged by the League. The exchange between the Flash and Aquaman as an expository tool to introduce JLA readers to the Doom Patrol is classic Mark Waid. Bravo! I especially love how Flash's question just hangs out there for Aquaman (and the reader) to ponder, with Flash completely oblivious to the awkwardness of the moment. I'd love to see Aquaman and the DP team up a little more frequently, as Aquaman frequently seems more apt to be an outsider than a headliner. The Other Elasti-Girl. . . The other Elasti-Girl, now officially known as Mrs. Incredible - at least as far as comics go - found her way to the new comic book shelves this week under the pen of - surprise! - Mark Waid. The four-issue series, written by Mark Waid and featuring art from was released from BOOM! Studios on Wednesday and will also be available on newstands everywhere.
. . . and one other thing. 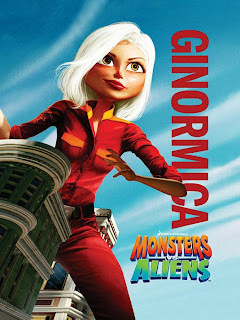 . .
Monsters Vs. Aliens opens to day with Reese Witherspoon providing the voice for Susan Murphy aka Ginormica. Looks like a fun movie to me. The kids are dying to see it. Let me know what you think about ANY of these topics. Ted Bruder was a super-powered employee of Thayer Jost, who hoped to create a superteam branded with his sensibilities and guided towards his interests. Essentially the very worst end result of the team Maxwell Lord hoped to assemble in Giffen and DeMatteis's Justice League. To that end, his team was comprised of four less-than-spectacularly-powered individuals. Shyleen Lao aka Fever had the ability to increase the molecular vibration of objects so they would heat up. Vic Darge aka Kid Slick could eliminate friction around his body. Ava aka Freak who possessed prehensile hair, much in the same manner as the Inhumans' Medusa. Originally dubbed "Fast Forward" for his power of prescience, Ted Bruder was soon (second issue of the third volume) branded with the nickname "Negative Man" due to his consistent brow-beating and complaining about anything and everything. Ted, it seems, was one of those people who would complain about having nothing to complain about. In his first encounter with Robotman, Cliff warns him to look thirty seconds into the future as Ted gets carried away yelling at Cliff. Deciding to back up a little to avoid getting his clock cleaned by Robotman, Ted begrudgingly allows Cliff to begin consulting the team. Besides having some amazingly amazing art from then-unknown Tan Eng Huat, this John Arcudi-penned series was every bit as quirky as any interpretation of the Doom Patrol. It embraced the DP legacy while trying to deepen the legend. 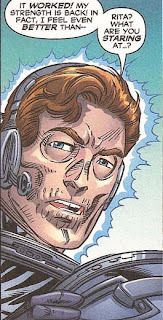 Robotman, however, wasn't really quite Cliff Steele, as I'll cover at some point in the future. Maybe Ted can clue us in as to when that'll be. . . So this is the third installment of Elasti-Girl Friday. To celebrate such a momentous occasion, I thought I'd provide Elasti-Girl's origin, as told in My Greatest Adventure #80. The images shown here are mostly from the DC Blue Ribbon Digest mentioned earlier this week. 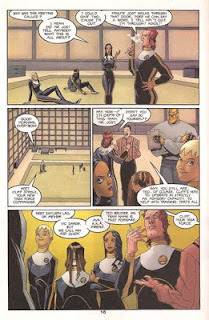 The first panel, however, is from the first volume of The Doom Patrol Archives. As if you couldn't tell from the brighter art. The first of the DP to share her story, Rita is essentially givent the third degree - placed under a spotlight to share her tale of woe. 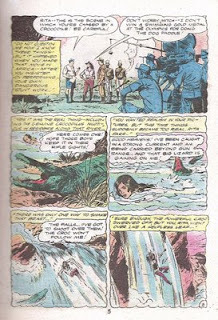 Rita was filming a scene with a crocodile (I bet she'd appreciate modern CGI) and declared the only way to avoid the hungry croc was to plunge over the edge of a raging waterfall. Turns out she was right. The croc, being no dummy, turns away, but Rita falls. The rest of the origin lies below for your perusal. 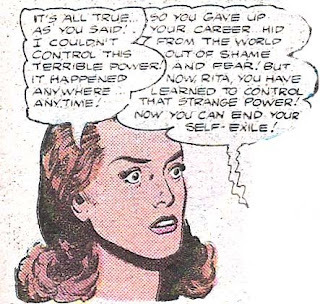 Poor, poor distraught Rita Farr. Cursed with the "terrible" power of growing larger or smaller, she walked away from a promising movie career. 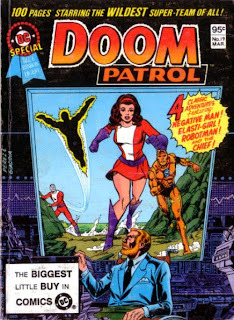 Good news for the readers, though, as she became the heart of the Doom Patrol. Truly, what more needs to be said? What an awesomely fun back cover! Not to be confused with Pabst Blue Ribbon, DC produced a fine line of digest reprints of some great stories. The nineteenth addition to this fine line was dedicated to the Doom Patrol. For fun here's some linkage to another Rob Kelly! site featuring those same Blue Ribbon Digests. I saw this beauty once a long, long time ago and didn't buy it. Since then, I've been trying to track it down and thanks to my "dealer", Scott, over at Back to the Past in sunny Livonia, Michigan I was able to get my grubby paws on it. When I emailed Scott to see if they had it in stock, he replied, "You mean like this one?" His expression in this photo is priceless. I expected him to continue to send updates, peeling the pages out of the book and laughing. Or at least post a ransom note. Later that day, the book was out of Scott's hands and on its way home. The gorgeous George Perez cover (with a new outfit for Rita, seeing as this one has sleeves) promises 100 pages of goodness, but the page numbering stops short. The last numbered page is 98, which I've chosen to share with you. Keep reading. You'll get there. I'm thinking the inside covers were included in the page count. At any rate, this issue reprints some choice DP stories from yesteryear. 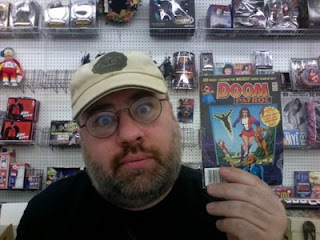 Published in 1982, it reprints My Greatest Adventure #80 as well as Doom Patrol #86 and 90-91. The gem of the collection, however, is this diagnostic illustration of our buddy, Cliff Steele. Also rendered by Perez, this drawing has only ever appeared in the digest. Perez also added some new artwork for the back cover, which I will add in a little later today. Be sure to check back. Coming up Friday, I'll be returning with some more Elasti-Girl Friday fun. Until then, keep Patrolling. First things first - yes, this is terribly late. Or not really, after all, it is still Monday. Secondly, sorry to string you along Ted Bruder fans, but maybe next week. Yeah, I'm taking the easy way out here, this week, Negative Monday features the Who's Who entry for Valentina Vostok. She first exhibited the negative powers not as a dispatchable spirit, but rather could transform herself into an energy being. As time went on, however, her powers came to manifest themselves in a manner nearly identical to that of Larry Trainor - the Negative Man. 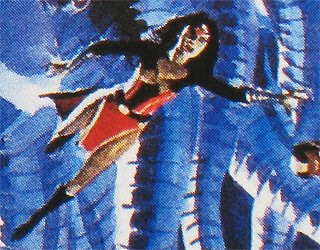 The major difference was that Vostok's expression of the negative being was decidedly female in silhouette. The commonality ad mutual familiarity with the Negative spirit would eventually lead to a struggle between Vostok and Trainor. It's been a bit of a crazy week this week, but no way, no how was I letting Elasti-Girl Friday slip by without a post. This week's post comes from the eighth issue of the current run of The Brave and the Bold, back when Mark Waid and George Pérez were still on the book. In DC's current mindset, a book as openly fun and adventurous as this one is quite rare, even more rare is a team-up like this: Flash and the Doom Patrol. The team-up here is a wink and a nod to the issue #65 of the original B&B series. Metamorpho and the Challengers of the Unknown also make appearances in this book. 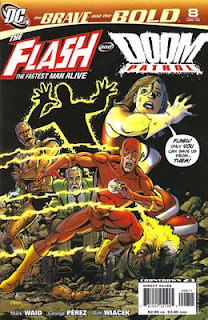 The basic premise finds Wally West (Flash) and his wife Linda visiting Niles Caulder at the headquarters of the DP in Prague for advice and assistance regarding the unstable powers of their children, Jai and Iris. Wally and Linda are concerned that the children's powers might prove fatal for the kids and are exhausting every resource to try and curtail that. I've included the cover (above) and a page from inside (below). Rita's first line in the book was to admonish Chief for being brusque with his guests. She greets the West family at the door, and its Chief with, "Oh, Chief, where are your manners? Honestly!" From there she warms up to the twins and takes them off to see the torture chamber. Her role in this book is an eerie housemom/lab assistant role. Very similar to the way the character was played in the 1960s, but with a modern sensibility that gives her a very creepy overtone. This is especially obvious in the dinner scene with the West family and Metamorpho all gathered round the table with the Dom Patrol. I personally found this issue to be the most enjoyable of the series (and it is available in the second collected edition). What really made it all for me was Iris trying to discreetly ask her daddy what is "wrong" with Rita. As a parent myself, I enjoyed this interchange, and can easily put myself in Wally's chair. In the end, it is through the powers and abilities of al present that Jai and Iris are able to achieve a more stable condition. Unfortunately, this encounter doesn't get referenced during the main Flash run, at that time also written by Waid, but the important thing is that the kids are better. There you have it, the second Elasti-Girl Friday. Have a great weekend and come back Monday for another Negative Monday. It's Monday and here's some negativity that isn't related to your job or that stupid time change thing. 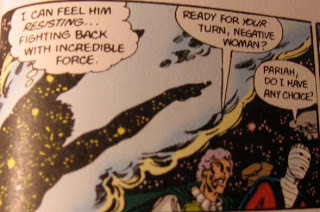 When we had the Crisis on Earth-Blog crossover last week, I mentioned that Negative Woman played an important role in the outcome of Crisis on Infinite Earths. Today, I'll share. Please excuse the quality of the imagery, the frames are shot digitally from my Absolute edition, the cover of which features the heroes called into the final attack by Harbinger. In the twelfth issue of the maxi-series that changed the DC Universe, Harbinger gathers a crew for one last attack on the Anti-Monitor - taking the battle to him. 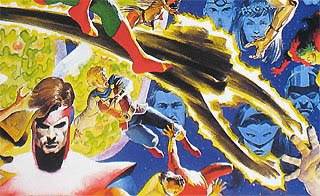 During the epic struggle, the heavy hitters like Captain Atom, Dr Light, Firestorm, Superman (both from Earth-1 and 2, along with Superboy from Earth-Prime), Lady Quark, Jade, Firehawk, Power Girl and many, many more are called into action to unleash their energy-based distance attacks upon the Anti-Montior who is burning under the radioactive touch of Valentina Vostok's negative spirit. Her call to action from Pariah. Her thoughts on what may be her final greatest adventure. Her effect upon the Anti-Monitor. There you have Val's first appearance on Negative Mondays. Maybe next week we'll get to Ted Bruder. What a difference one week makes, eh? I went from Negative Fridays to Elasti-Girl Fridays. Bloggery is so fickle. At any rate, here's the first salvo of Elasti-Girl Friday. This is the art from the 1990 Who's Who series that was presented as loose-leaf pages with binders so YOU could make your own logical (or completely illogical) order to the entries of your Who's Who. 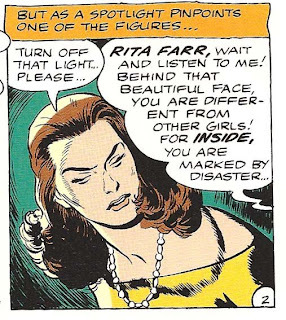 Lorraine Szramski and Alan Smithee teamed up for this art, and I gotta tell you, that's quite a nice retro-modern, glam-pinup take on Rita Farr. 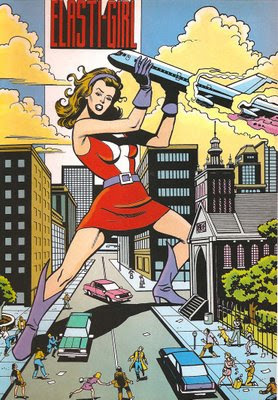 Szramski leaves no doubt about Rita's feminine charm, striking a movie poster pose while single-handedly stopping a jet before it could destroy a bustling neighborhood. Down in the bottom right corner, one person is so amazed, his arms disappeared at the elbows! According to this, Rita clocked in at 5'6" and 126 pounds. Of course, when she's role-playing as the 50-Foot Woman, she's obviously a little taller and a whole lot heavier. We all know it's not nice to talk about a woman's weight though, right? That's it for this edition of Elasti-Girl Friday. Have a spiffy weekend. 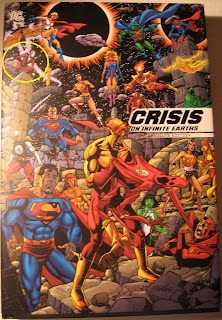 Today, throughout the multiblogiverse, blogs are dying, blogs are living, but most importantly blogs are celebrating one of the greatest crossovers ever told: Crisis on Infinite Earths. Well, maybe not the entire crossover, but one of the most critical images from the crossover. It may not have been the first, nor the last, crossover, but it set out with a purpose and (for the most part) achieved that purpose. CoIE set out to streamline the DC Universe. Characters were slated to die, others were created for this series, but virtually no character was left untouched. The DP were called upon to act during this time of Crisis, under the red skies, alongside every other hero. Although their appearances were extremely limited in this event, the Anti-Monitor would never have been defeated if not for Negative Woman. We'll cover that here on a Negative Monday. 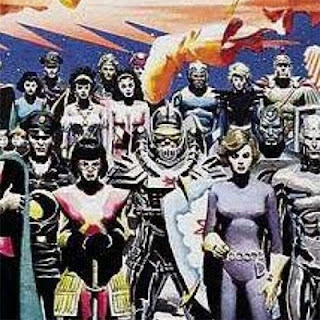 As provided by the Irredeemable Shag (of Firestorm Fan and Once Upon A Geek), here we will be covering the Patrol members as they appeared on the George Pérez drawn and Alex Ross painted Crisis on Infinite Earths collaboration from 1998 used as the cover artwork for the first ever collected version of the Crisis on Infinite Earths. 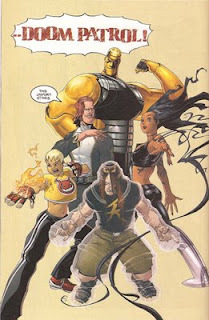 This was additionally marketed as a poster, used on the Absolute Edition slipcase, and featured as the cover for the trade paperback. 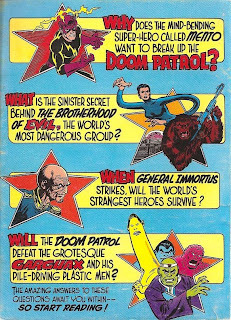 The Doom Patrol, such as it was during this time, also found itself participating in the Crisis. Recently relegated to comic book limbo, the DP at the time was Paul Kupperberg's and Joe Staton's rendition first introduced in Showcase #94. Arani Desai, claiming to be the wife of Niles Caulder - the Chief. Pérez rendered Celsius either doing the Egyptian or swimming through space. At this point in time, Arani was the de facto leader of the DP, who were sidetracked in the quest to find Niles Caulder. Valentina Vostok, the host for the Negative Spirit in the guise of Negative Woman. 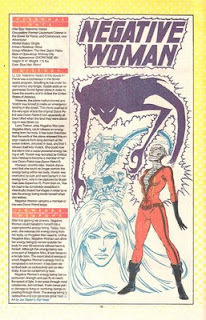 Negative Woman played a critical role in the outcome of the Crisis, traveling with many of the heavy hitters in their bid to end the Anti-Montior's reign. Joshua Clay, the hot-tempered Tempest. In this image he is separate from his team, both feet firmly planted on the ground. 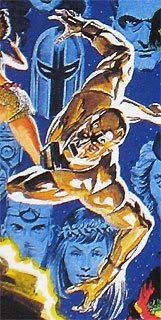 Cliff Steele - Robotman. 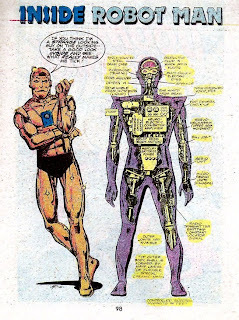 While Staton originally rendered Robotman v2 (or v3, depending on frame of reference) differently, Pérez put Cliff back in a body that more similarly resembled his original visage. Looking as though the world was yanked out from under him, one can almost here Cliff give warning, "Look out below!" 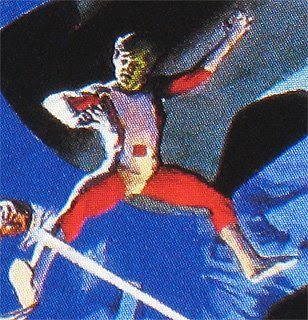 Also present throughout the entire Crisis was former Doom Patroller Changeling, formerly (and currently) known as Beast Boy. Garfield Logan was at his peak in popularity during this series. As a member of the Teen Titans, most fans never had any idea he had once run with such a cluster of freaks like those in the Doom Patrol. Mento made a split-second appearance and an even smaller appearance on the cover. That's right, Mento is under the Flash's boot. A last minute add, perhaps, but a testament to the abilities of Pérez and Ross that even at near microscopic size, this character is still recognizable. Below are the highlighted actual locations of the DP in this vast galaxy of DC characters. As you can see, this is a veritable "Where's Waldo?" of the DC Universe. The first appearance of this image above is clear of all markings. Click on it and try to find your favorite DC characters. Some other characters to look for (complete with relevant links to find them on) are Firestorm, Flash (you'd have to close your eyes to miss that), Aquaman (and what better excuse to discover or rediscover the Aquaman Shrine? 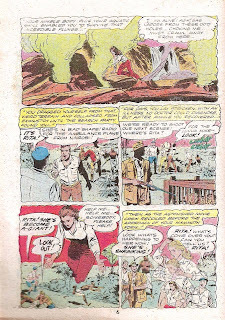 ), Phantom Stranger (another fabulous Rob Kelly-powered site), Green Arrow (who had an even smaler role in Crisis than the DP), Hawkman (one of which was supposed to die during Crisis, but Katar Hol was enjoying the good life after a successful Shadow War), Plastic Man (another fabulous blog from Rick of Mail It to Team-Up fame), Martian Manhunter and the greatest incarnation of the Justice League ever - Justice League Detroit (both from Frank Lee Delano). Extra special thanks to Shag for organizing this Crisis on Earth-Blog! Thanks also to Rob! for the masthead and Rick for the uber-cool video. One of the great things about a blog, as opposed to a book or magazine, is that pagination and re-ordering parts and pieces is nowhere near as time consuming or painful as it is for printed material. Fridays will now be Elasti-Girl Fridays and Mondays will be Negative Mondays. See? Order changed, no craziness. Why the change? 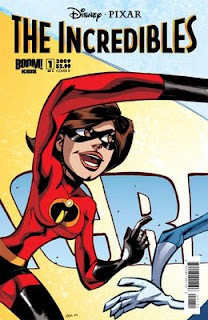 Well, it came to me as I was drifting asleep that "Elasti-Girl Friday" was a cute little play on words, a wink and a nod to the "Girl Friday" concept. That and Mondays tend to be a little more negative anyway. Maybe the two negatives on Monday wil help make Monday positive, right? Starting next Monday, look for Larry, Val or Ted in this space. Hopefully I can get the first Elasti-Girl Friday post up this week.